This past weekend was our monthly game day, and something strange happened. After two games set up, with people at the tables, two of us were left out! Rarely do we play two player games in the group, but this was one of those times. Given the length of the games being played at the other tables, we wanted to play something that wasn't very long. 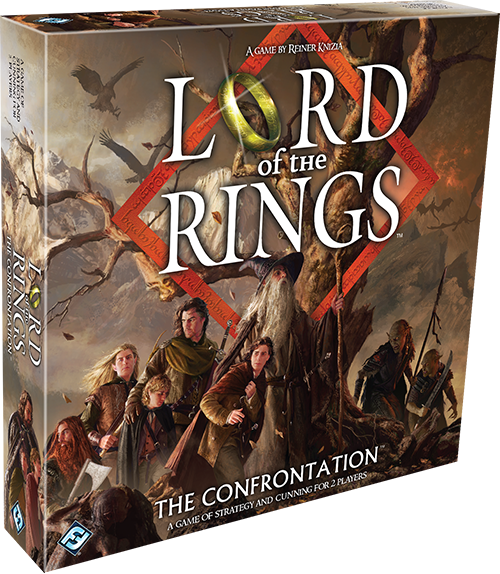 My opponent and I enjoy both heavy strategy and theme (not true for everyone), so we picked The Lord of the Rings: The Confrontation. You could think of this game as a heavy version of Stratego, with more theme thrown in. It was designed by Reiner Knizia, who is a well known designer in our little hobby world. I tend to run hot and cold with his games. I currently own a few, and have owned others that I didn't like and traded away. is the version I own. Elegance. LotR: The Confrontation has a fairly small, uncomplicated set of rules. Each side has nine pieces which represent characters from the story. For the most part, you can move one piece forward to one of two spaces on your turn. Two pieces from the same side can occupy one space, except in the four center spaces which correspond to the entirety of the Misty Mountains range. If the space is occupied by an enemy piece, there is combat, which is based on he cards in your hand and the strength of the characters. Each piece has a special ability which impacts combat, but they are simple. Merry, for example, instantly defeats the Witch King. Brevity. The game plays in roughly 30 minutes. That makes it short enough to switch sides and play again. Theme. While Knizia is not known for thematic games, and many think his games are very math intensive, this game does have the feel of the Lord of the Rings. It isn't incredibly immersive, like some other Tolkien based games, but the abilities and movements of the pieces make sense from the perspective of the story. Just like most games that are asymmetrical (the different sides have very different abilities), many people think that one side has the advantage - the Sauron player has an advantage. The exception would be those who think the other side has an advantage. Typically, nearly everyone sees that one side is better, but no one can agree on which side! The solution is two play two games and switch sides, keeping some kind of score in between. The game is recommended for ages 10+, and that seems about right. It is currently available as a deluxe edition, which has additional characters which can be mixed in.